Welcome to Boozefish Wine Bar — a European Bistro. Owners Chuck Kreimendal and Maija Diethelm created a unique concept by opening a European Wine Bar in the Kansas City Metropolitan area, just northwest of the Country Club Plaza on Westport Road. 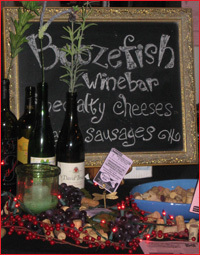 Boozefish has an extensive wine menu to educate people about wine and to show them how fun it can be to do so. We also provide unique, fully flavored foods from all around the world. Additionally, Boozefish has several beers on tap, as well as a fully stocked bar, and fun events during the week with great weekly Happy Hour specials.